We just can't wait to get on the road again! Sing it Willie. Well we left Enota a month or so ago, went to the Orlando Gospel Truth meeting in May and was so blessed by Andrew, once again. He actually called us on stage to speak to the audience about how our testimony on Financial Stewardship has impacted our lives. It was wonderful to meet so many new friends that were inspired and moved by our story. But what is more interesting is how they inspire us...there stories seem to be so much more incredible. I can't believe some of the testimonies we are so fortunate to witness to. I'm convinced each day that EVERYONE'S story is so important. We each, as a body of Christ, have a story that means something to everyone. Since we are all in the image of Christ, and we love the same father..it stands to reason we each experience something that ultimately connects us. In June, we attended the Atlanta Gospel Truth meeting and once again was blessed by Andrew's mention of our testimony and had spoken about us to the large group in attendance. Here again, we met more incredible soldiers for Christ that have spoken with us. God is awesome and so perfect...ya know I never get tired of living a life with Him. He's an awesome father...always believing in me even when I don't believe in myself...loving me when I don't particularly love myself and the things I do and say. But He never condemns me, or shames me. For the last few weeks we've been in Jacksonville. Kurt took on a "job" with a past Husband-For-Hire client who purchased a new home and would only let Kurt work on it. Kurt's been doing such a wonderful job along with our new "brother" Art. They have truly put their hands to quite a job. We left the area and are heading up to Hot Springs, NC to a beautiful 210 acre Christian retreat center. The people who own the mountain started this ministry about 20 yrs ago, bringing people to the retreat/lodge/center for meetings and retreats, etc. They are getting up their in age and place an add in Craigslist! We found the ad, answered their call and now will be heading up to see what the Lord has for us to do there! We are now in the process of putting together "The Ultimate Christian Leadership Experience". This is going to be an awesome 3 day adventure in Christ. Through all my research, I haven't found anyone doing this type of "Survivor" program. Body, Soul, Spirit and Mind! I'll keep you all posted about it...you will definitely want to tell your boss, pastor, friends and even family about it. I hope you are all well...and experiencing the love of the Lord in your life. Take it, Own it, Deliver it to those you meet in your life. So much going on...God is so awesome. Since my last post, Kurt's mini-video was shown internationally on Trinity Broadcast Network and several other Christian stations. Andrew featured the video in his new Financial Stewardship series. The response has been so incredible. "More than" we could have expected. People from all over the world has contacted Kurt and I to express how it effected their lives. We also has been so blessed by the generous donations to our ministry. We were just in Orlando and will be in Atlanta on May 10-12th at the Gospel Truth Seminar (www.awmi.net). If anyone has a chance to attend the seminar I guarantee it to be an event you will never forget. It will change your life. Things here at the Mountain retreat are going well. Many projects to help with...getting ready for the 2200 kids from the Life Teen group with the Georgia Archdiocese coming to Enota for 8 weeks. We are installing zip lines, obstacle courses and other activities that they will be doing while here on retreat preparing for their confirmation. I hope all of you are doing fantabulous...and pray that the Lord is with you always. A Place Called Home...at least for a little while! Well we are in our new home venture....Hiawassee Georgia! Never did I think I'd be in a place like this. The girl from Boca Raton with weekly massages, pedicures, facials....ha! Now I'm living on a working farm, self sustainable mountain retreat property. I can see it now....Grandma and Grandpa Solimine & Cutroni with Jesus looking down and just laughing! Along with my Aunt Marie chuckling. How did this "well preserved" Boca girl come to this life. I haven't a clue...but I love it! It shows me just how out of control a control freak like me just really is. When we say "Lord use me, guide me and direct me" He doesn't necessary send you to the mall's Louis Vitton store to pick out the newest style. He brings you to a new place in life that make LV look like a brown sandwich bag. We are at Enota Mountain Retreat, www.enota.com, paradise in the mountains. It is so beautiful, peaceful and a wonderfully created thought of Dr. Suan Freed, a chiropractor from Miami. Suan got tired of the "rat race" and working for "things" and felt a calling by God to create a sanctuary for others to go to. Wherever you are in life, whatever you may be looking for, this place brings out so many things for so many people. It's awesome to watch families with kids of all ages join together as a family should. Tents sites, RV sites, Cabins and even little hotel rooms. Trampolines in ground, a full farm with animals, organic farming, trails to 200 foot waterfalls, trout fishing, and so much more. Kurt is putting his hand to so many different tasks; carpentry, electrical, plowing field, he was even the Chef today for the whole breakfast and loving every minute of it. I'm even helping out with some things. I served breakfast today to 30-40 guests, front desk reservations etc. My brother in law/sister in law are coming up here to work too! We are taking it day by day, Use us Lord! Our New "Blessing"...she's so pretty. Hi everyone...God is Great. When we ask for something He gives us MORE THAN....more than we can imagine in our human minds...Ye of little faith! 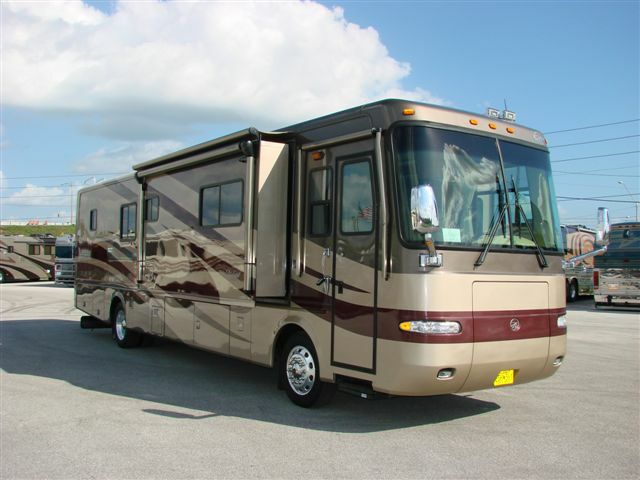 Kurt and I prayed for a new RV because Betsy was getting old and needing a face lift! We asked for a newer unit with more space, God gave us a beautiful 40 foot, 3 slide, diesel motor home with all the trimmings. God tells us in Ephesians 3:20; Glory belongs to God, whose power is at work in us. By this power he can do infinitely more than we can ask or imagine. Through our good works for His good we can accomplish the tasks and plans He has for us. I am learning to listen for His voice to direct me to the work He has planned for me. Every day I go to work, I try to do for Him, not for me, not for my employer or customers, but for Him. Then I can be assured that I will do something special for Him. If I rely on my understanding then for sure I will mess things up. I can't possibly understand (on my own why) how this beautiful gift came about that is why I completely give it to the Lord. We could not have planned the whole scenario like... how the owner of this motor home would be a fellow Pastor- willing to owner finance for us - total strangers across the country! Praise God....HE IS THE PROVIDER, HE IS THE MIRACLE WORKER. Our direction now is to touch as many lives as possible traveling God's highway. So many blessings are coming from the video and many people are being touched. Hope abounds us all. Well that's about all for now...stay healthy, happy and in the Lord's will. Question: Do you press the "delete" button? So what kind of protection does our hard drive have? How often do we keep it updated? Is it the latest version? Do we realize that our hearts and minds ARE our hard drives? Do we keep it updated with the word? What version do we use? The old or the new? Is it completely protected from Satan's viruses? We must make sure we are protecting His "hard drive"- YOU.....repeatedly hit the "delete" button and you won't be infected with negativity of any kind! And surely Satan's virus won't shut down your hard drive- Your Savior is your ultimate protector. He rules over all...His protection is all we need....His unconditional love covers everything. Release your self from the traditions of our past, the programs we've been indoctrinated with and only THEN will you truly be free to operate your hard drive the way is was intended to be! Our new business cards came out and may I say they look really good. Now we can start to give them out to people and hopefully get some speaking engagements. Another update is that we found a great couple to purchase our RV...they love it. We really needed something a little newer and more fuel efficient since we are going to be traveling more. Also, it was a 1999 and well we couldn't afford to fix anything major should it need it, plus, I work in it full time and that one slide was making the inside really seem small. I am very grateful for having it, but I believe whatever is next the Lord will provide what we need. I am trying put together a "Pamper Me Pretty" fundraiser for homeless and battered women. I need hairdressers, nail techs, gently used/new purses, and a "finance person" who can teach a basic finance lesson to the ladies. Anyone interested....let me know. It will be fun and not take up too much of your time. Good for now...May you find the peace of the Lord within your spirit and soul. I can't believe it's been so long to update my post. Well I guess my new years resolution will be to keep this up. I really do have followers, not many, but a few who have noticed my absence. Hopefully, if I do post I will attain more people. The "mini" movie is suppose to be completed next month. We are so excitied to see what they came up with. The response so far has been really positive. He's been working on his Jesus-For-Dummies 48 part discipleship evangelism presentation to go full time next month as well. We are in the process of going to New Mexico to work with Habitat for Humanities RV Care-A-Vanners program. Kurt has a lot of construction/handyman experience and he is so excited to put it to good use. He also will be setting up outside the RV a little outdoor stage to do some "talkin" to the people. There are so many Blessings in our lives and in yours, we just have to make a purpose to look for them. My wish to all my friends is that peace will fill your heart...no rather; peace will overflow from your heart. May you receive more than you wished for....our God always give us More Than what we ask for. Well my life has been filled with quite a mix of "unusual" events. Anyone who knows me, can certainly attest to it! I'm told to be a combination of Lucille Ball and Sara Bernhardt. Geez, now that doesn't give away my age.